Access enterprise data through your mobile device quickly, effectively and securely. 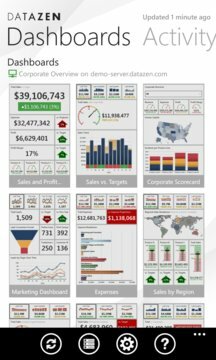 Datazen for Windows Phone allows you to connect to a Datazen Server and access KPIs and Business Intelligence dashboards based on Excel, SQL Server, SharePoint and other data sources. 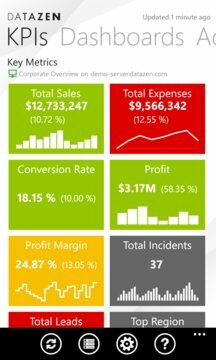 Microsoft collects data about the use and performance of our free software. This helps us learn how to improve our products and give you a better experience. You can turn off this data collection on the Settings screen.